The L1 Flight Controller will soon be tested on another manned aircraft, the F-16. ACRL students are working hard to design the flight controller for the test that will be carried out this fall. MechSE website has featured a detailed article on the upcoming challenge: “Hovakimyan’s adaptive control to be tested on fighter jet”. After a successful flight test on Calspan’s variable-stability Learjet aircraft last year, an L1 adaptive flight control system is being modified for the U.S. Air Force’s VISTA F-16 aircraft by Professor Naira Hovakimyan and her graduate students, Kasey Ackerman and Javier Puig-Navarro. Hovakimyan, a W. Grafton and Lillian B. Wilkins Professor in MechSE, has been developing the L1 adaptive control theory since 2005. 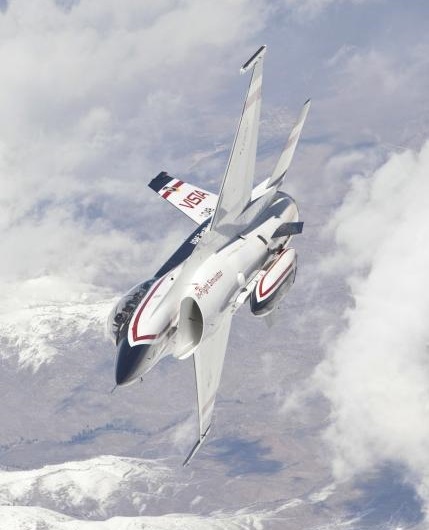 The VISTA flight test, conducted by the U.S. Air Force Test Pilot School, is expected to take place in September of this year at Edwards Air Force Base in California. The progression from testing on the Learjet to the VISTA F-16 was a natural one, said Puig-Navarro, and the next steps will be crucial. The Learjet testing itself was a huge milestone, but only certain aspects of the L1 system were tested on the Learjet aircraft. The Learjet was chosen for the first test at Edwards Air force base because it is less expensive to operate and allowed the researchers to collect over 18 hours of flight data. Ackerman said the Learjet flight tests demonstrated the ability of the L1 flight control system to consistently restore the safe flying and handling qualities of the nominal Learjet aircraft in the presence of several failure configurations. With the VISTA F-16, additional failure configurations will be tested to demonstrate the ability of the L1 flight control law to compensate for off-nominal dynamics, actuator failures, and other types of uncertainties not included in the Learjet flight tests. Additionally, the structure of the control algorithm will include some modifications to better estimate the internal states of the aircraft and account for a wider range of uncertainties. Once these changes are in place, the L1 can be implemented on the VISTA for flight testing. Like the Learjet, the VISTA flights will be manned, so safety during the flight test is a major concern. The VISTA comes with a Variable Stability System (VSS) computer, which is used to simulate off-nominal dynamics and aircraft failures, as well as ensure the safety of the flight crew. In the event of a problem, the VSS computers can lock out the research flight control system and give control back to the safety pilot. Because of these safety features, Ackerman said it isn’t necessary to do as much verification and validation testing of the flight control system as would be required for a non-research aircraft. Before the algorithms are tested in flight, extensive computer simulations will be performed to guarantee that the flight control algorithm is correct and the L1 performs as expected. The team will initiate simulations with the nominal VISTA aircraft model and will progressively stress the control algorithm by exposing it to more challenging scenarios. After the September flight tests, Hovakimyan and her team hope to be one step closer to incorporating an L1 control system on more advanced aircraft, leading (in the distant future) to implementation on commercial aircraft. L1 adaptive control has the potential to make flights much safer, Ackerman said. In the event of a failure, it allows the pilot to focus on landing the airplane and getting the passengers out safely. Additionally, since the L1 system can compensate for undesirable dynamics, it may result in a more pleasant flight experience for passengers, said Puig-Navarro. L1 adaptive control has been in development for only 10 years, and many more test flights and extended research are required before it can be considered for commercial use. The first flight tests resulting from Hovakimyan’s research in L1 adaptive control started when NASA, Boeing, and the Air Force were researching methods for improving aviation safety from 2005 to 2010. According to Hovakimyan, previous adaptive methods for controlling aircraft under dangerous conditions needed improvements. “It was clear that the conventional approach to adaptive control aiming for complete compensation of uncertainties, irrespective of their frequency range, achieved only asymptotic results without any quantification of the transient performance bounds, and it is during the transients resulting from unpredictable circumstances that crashes happen,” she said. During the first tests on NASA’s AirSTAR’s Generic Transport Model remotely piloted aircraft, the L1 adaptive flight control system was the only research flight controller cleared by NASA test pilots for the unpredictable, highly uncertain stall and post-stall flight regimes, and it consistently delivered predictable performance, rendering the aircraft controllable for the pilots. Ackerman and Puig-Navarro are looking forward to how their work will continue to unfold. The team believes that the VISTA flight tests will build upon the success of the NASA AirSTAR and Learjet projects and continue to demonstrate the efficacy of L1 adaptive control in aviation safety.